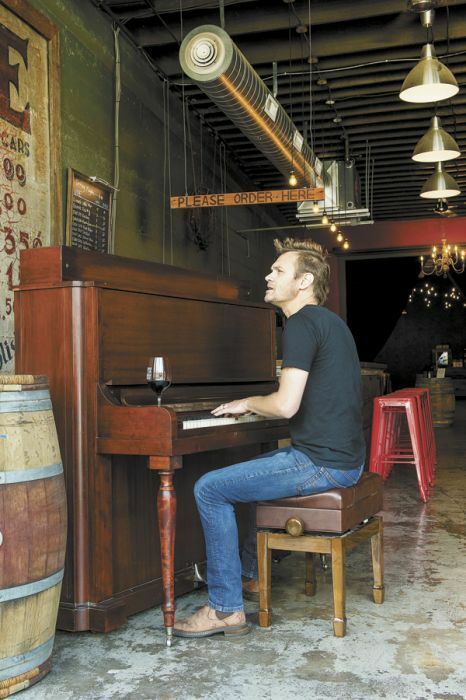 According to Ryan Lee Sharp, winemaker at ENSO Winery, making wine is a process similar to making music — and he’s familiar with both. 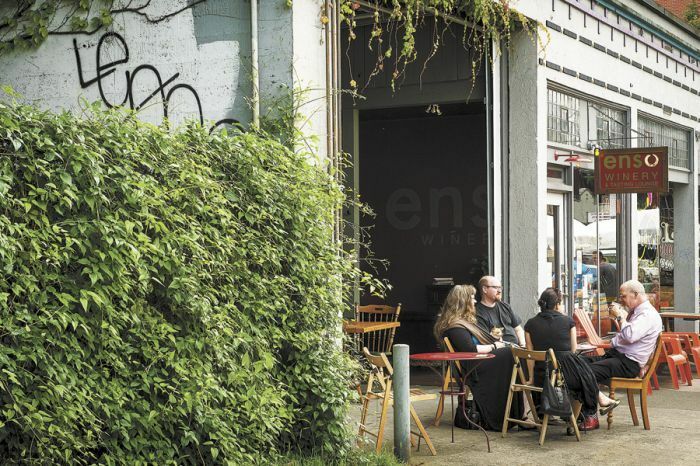 At ENSO, on Stark Street in inner Southeast Portland, Sharp has created a venue blending winemaking facility, wine bar and event space. “Music is like wine, it depends on what you’re in the mood for,” he says, citing musical references ranging from Tom Waits to Taylor Swift, Counting Crows to Sigur Rós, Sufjan Stevens to Björk. As the frontman for his own band, The Cobalt Season, Sharp wrote and recorded four albums of soul-searching songs and performed them at shows across the country. He was joined by his wife, Holly Sharp, who is a graphic artist as well as musician. 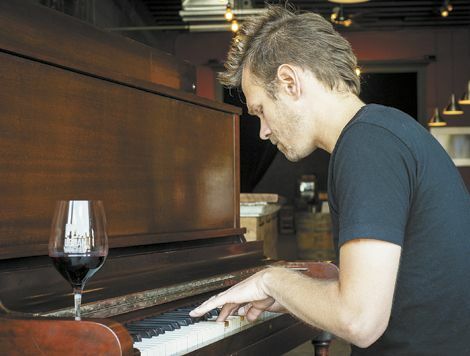 Nowadays he processes winegrapes — Zinfandel, Counoise, Mourvèdre, Petite Sirah, Grenache, Malbec, Pinot Gris, Pinot Blanc, Sauvignon Blanc, Riesling, Muller-Thurgau — instead of lyrics, but he finds parallels between the two creative pursuits. “When I conceived the idea — not that it’s some crazy, wild idea — but I couldn’t find anyone else who had done it the way I wanted to do it. 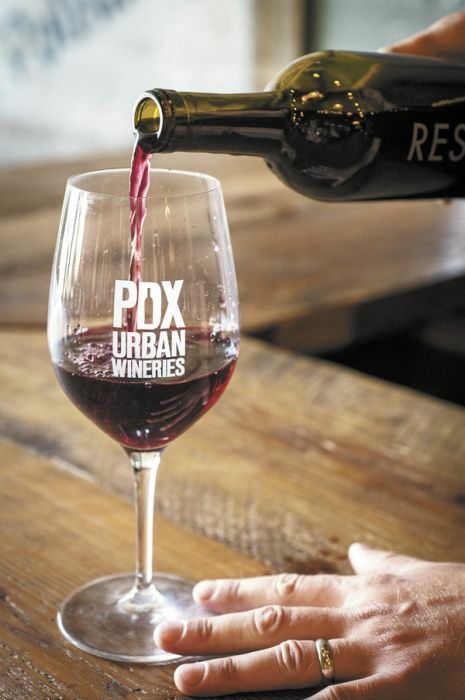 Most wineries are still operating on this very traditional model, with a tasting room and people buy a bottle when they leave, or, there are wine bars. I wanted to put the two together, like a brewpub or a coffee shop that’s also a roastery,” he says. Sharp opened ENSO to the public about two years ago. On any given night, there may be people congregating to attend a literary reading in the back, some just dropping by to grab a bottle of wine to go, while others lounge in the front bar area leisurely sipping a glass or two. “Part of what my thing is, is creating spaces for people to gather around,” he says. Sharp honed his skills of playing to an intimate audience during years of performing music. The last year or two of playing music full time, they mainly played house shows. Playing off the crowd is not unlike pouring wine, as Sharp has discovered. “Originally we poured wines into regular wine glasses, but now we offer flights that are self-guided with tasting notes,” he says. Sharp stopped touring five years ago, when he and his young family relocated to Portland from their previous home base in San Francisco. Every once in a while, the Sharps would stop and stay for a few days in Portland to check it out. “We really fell in love with it here,” he says. 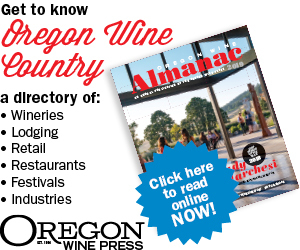 Making the transition from guitar to grapes, Sharp took classes at UC Davis; then completed his winemaking education at Chemeketa Community College in Salem. He worked for Arcane Cellars, a small, family-run winery in the Eola-Amity Hills, and still buys fruit from them for making his own wine at ENSO. Sharp doesn’t fret not performing music. It appears music and wine are not so different after all. For more information about Sharp’s music, visit his music website at www.thecobaltseason.com. Hours: Mon.–Fri., 4 to 10 p.m.; Sat.–Sun., 2 to 10 p.m. Happy Hour: Mon.–Fri., 4 to 6 p.m.